In Ep. 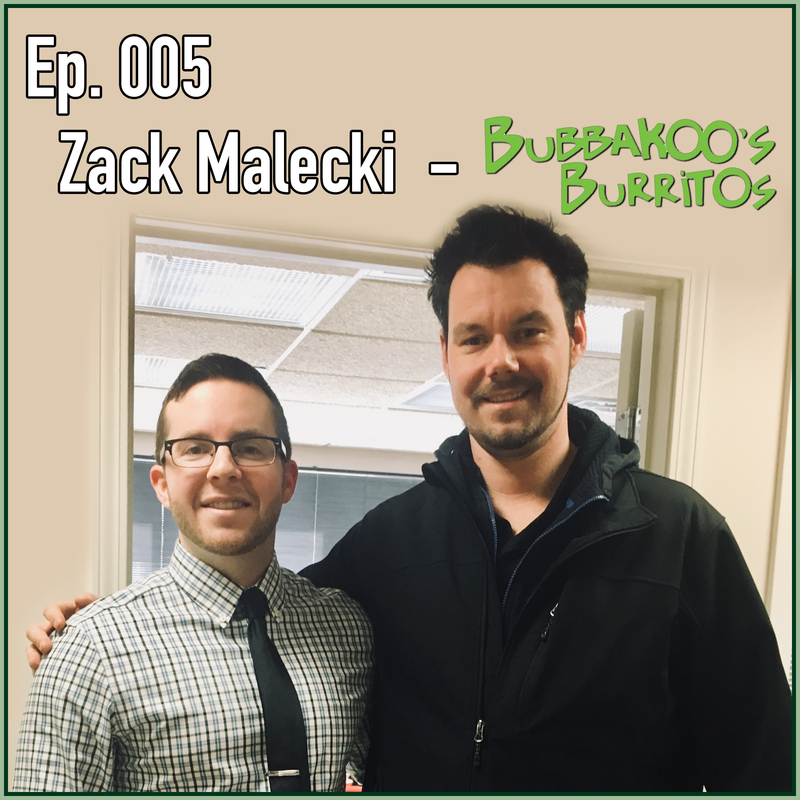 005, Tim talks with Zack Malecki, the owner of Bubbakoo’s Burritos in Wall Township, NJ. Tim and Zack discuss how Zack got started with Bubbakoo’s, and how he ultimately decided to open his own location. They discuss the ins and outs of franchising, and what the most important part of managing a team of employees is. This episode might make you crave a burrito, but sit back and enjoy Ep. 005 of Living With Money! Tim Mullooly: Welcome back to Living With Money. On today’s episode, I’m talking with Zack Malecki from Bubbakoo’s in Wall. Zack, thanks for coming on. Zack Malecki: Morning, Tim. How are you? Tim Mullooly: I’m doing well. Zack Malecki: This is what we like to see. Tim Mullooly: Yeah, exactly. Let’s dive right in. Bubbakoo’s is one of my favorite spots to go eat. I was happy to meet you at a Chamber of Commerce meeting. Tim Mullooly: Tell us a little bit of how you got started with the organization, Bubbakoo’s. Tim Mullooly: Yeah, I’ve been there a couple times. Zack Malecki: We sing, we dance, it’s a good time. I was 16 years old and he just hired me on a whim and I was just going to a movie, actually. I said, “Hey, let me just stop in here and see if they’re hiring.” Then I worked for them for about four years, about 20 years old, I broke off and did my own thing for four years. I didn’t really think anything of it. It was funny, Bill was actually one of my good friends and we lost touch over that four years. He’s like, “Listen, at least just come down and let me get you some lunch with one of the restaurants.” We had lunch. From upstate New York to the first store in Point Pleasant, it’s a night and day type atmosphere where you got nothing where I’m from and then you have the beach and you have things that are going on in this area. I liked it. Within a couple months, I made the decision to move down here. That was about eight years ago. February 1st was eight years when I moved down here and started working with Bubbakoo’s. Tim Mullooly: Wow. That was in the Point Pleasant restaurant and then you worked with corporate for Bubbakoo’s? Zack Malecki: Exactly, yeah. There was two restaurants when I started. There was Point Pleasant and Manasquan. At that time, we weren’t franchising, so yes, I worked for corporate for them for about seven and a half years total before going out on my own. Tim Mullooly: Do you know how or when they started to think about franchising? I know that there’s many more than just the two restaurants now. Zack Malecki: For those two, they have a strong corporate and franchise background, not only with Johnny Rocket’s but one of the two owners was also with Friendly’s for a time. For them, they’re big thinkers. Think big. They’re big thinkers and they essentially aren’t the type of people to just have a restaurant or two. They like the thought of having an operation. They would say this isn’t a Mickey Mouse operation, if you will. The sky’s the limit for them. One thing that will allow, and I’m pretty sure this is known, you won’t be able to continue the growth just because you don’t the foundation of the people behind you. That’s where franchising is going to be a good thing to grow the company, because somebody else has their own team of people and their own skills, and they can learn what we do, essentially, open up and duplicate what we’ve done for nine or 10 restaurants. Tim Mullooly: That’s pretty cool. Living in this area, I’ve seen the restaurants popping up all over the place. It seems to be going pretty well at the moment. Zack Malecki: It could always be going better, but yeah, knock on wood, we’ve been very fortunate. Tim Mullooly: When exactly did you start the process of opening the Wall location? You own and run the Wall location. Zack Malecki: Correct, yeah. I have a partner. Again, it’s funny how the people you meet and the people that you’ve dealt with for years comes back full circle. I had a customer of mine in the Jackson location, which was where I left Bubbakoo’s, it was in the Jackson location, he would come in four, five times a week and we became friendly. We started to talk about things, this, that. Then you get married, you have a kid, and you start wondering why you’re putting in so many hours for somebody else when I would say I’m responsible for a lot of the growth with Bubbakoo’s. I started when there was two and there’s over 20 now that are coming around. I’ve been involved with it. I’ve worked in the stores. I’ve helped open them, training, I’ve developing a lot of the franchise tools and programs. When he asked me that question, it got me thinking. Why don’t I do this on my own? I do it now, it’s just somebody else reaps the benefits. I don’t want to sound greedy or anything. Tim Mullooly: No, it make sense. You know the ropes at this point. You’ve been with the company. You could definitely handle doing it on your own. Zack Malecki: Exactly. At the time, I said, “No, I’m not interested.” But life happens, and then after about a year of thinking about that conversation he was still a four, five day a week customer and I just asked him again. I said, “Hey, would you still be interested in the offer that you threw out there?” He said, “Zack, I’d do this tomorrow with you.” That’s my current partner, John. We went into business together. It was great. Tim Mullooly: I’m not too familiar with the process of opening a franchise location, so did you have to go through the original owners of Bubbakoo’s to open your location? It’s all part of one bigger franchise, right? Zack Malecki: Yeah. You have guidelines, you have to say it’s two miles away from another store just so you’re not impeding on somebody else’s market. After that, really, as a franchisee, you’re responsible for finding your own location as far as what center you’re going to go in or what spot you think is good. The owners or the founders, Bill and Paul, they would come see it and they try to coach you and make sure you’re doing the right thing, and they would accept the location that you choose. Of course, it’s in their best interest that you’re successful. If they think that the rent is too high or the demographics in the area aren’t making sense to them, they would coach you in those decision. But ultimately, it’s up to the franchisee to decide where they want to be, negotiate the rents, and then of course fund the build-out and such. Tim Mullooly: For those who don’t know, the Bubbakoo’s in Wall is in the Kmart plaza right on the corner there when you get in. How did you go about finding that location? I actually grew up right across the street. Tim Mullooly: I’m very familiar with that plaza. Tim Mullooly: I think it’s a great spot. When I saw that Bubbakoo’s was coming in, I was very excited. How did you go about finding that location and getting it from what it was to being a Bubbakoo’s now? Zack Malecki: Sure. I live in Brick. Wall’s a very short commute to Brick. For me, just having my son, who’s 14 months old, being closer to home is going to be a more ideal scenario for me. Wall is in that area. It’s in between where our current locations are. More importantly, it’s right next to the high school and we do very, very well with that demographic. The kids can walk to our location. Then you look at what’s the rent structure like. That plaza I won’t say is the most highly trafficked plaza in Wall, therefore it’s not as expensive as potentially some of the higher trafficked locations, but it does have a couple core anchors, like Workout World, which is now Jersey Strong, and they have 9,000 or so members. Tim Mullooly: I am one of them. Zack Malecki: I am, too, but I don’t go. Let’s just figure. You have 4,500 people going in and out of that door on what we would say may be every other day. That’s a lot of pull. Then you have the Kmart, we’ll just leave it. It’s Kmart. But people go to Kmart. We’re right next to Mee-mom’s, which is a great breakfast spot. Between what’s in the plaza currently, what’s actually leased, and the high school, we thought it’d be a great spot to dive into. It’s corner. It’s a corner spot. It has tons of windows. It looks great from the outside. I think it looks great from the outside. Tim Mullooly: -in the plaza. Yeah, it’s crazy. Zack Malecki: It’s wild, before and after. Tim Mullooly: What it used to be. Have you guys thought about doing any sort of deal with the school for maybe lunches or giving them food for any kind of events? Zack Malecki: Yeah, in other stores, we’ve done something similar where, say, on Tuesday’s it’s Bubbakoo’s BubbaTuesdays if you will. We have a student meal. It’s a $6.00 student meal and there’s five options. For example, two tacos, little side of chips, and a drink. We would provide however many meals for however many students and work through that. But we do other things, like fundraising. We have tons of fundraisers with the high school and there’s the four elementary schools in Wall. It’s a Dine and Donate program and it’s people helping people, really. We encourage them to bring new faces into our restaurant and hopefully we can win them over. Then, of course, we would donate a percentage of the proceeds back to their organization, be it the schools or little league or whatever it might be. That really helps quite a bit. Tim Mullooly: That’s a good way to get intertwined in the community, as well. Tim Mullooly: Getting in front of more people and building up a good reputation in the community. Zack Malecki: I think every business should get involved in who’s essentially keeping them in business. Zack Malecki: Without them, you’re not going to go very far. Zack Malecki: It’s almost like a thank you, too. I look at it as it’s the least I can do to give back a little bit. They’ve chosen to support us by walking through the door. The minute somebody comes in, it’s like, “Hey, I’m coming in here to give you a shot.” The least I can do is do the same to them on a different scale. Tim Mullooly: The little things, it helps. But yeah, thinking back to my high school days, after school we would always walk down to Burger King or Dunkin Donuts or something, but if we had somewhere like Bubbakoo’s, which is even closer than those, I’m sure there’s loads of high school kids coming in every day after school. It’s definitely a good spot. Zack Malecki: There’s a good flow and not for nothing. I think that kids would gravitate towards the laid back surf atmosphere with action sports on the televisions and the good music in the restaurant. It’s not a small restaurant by any means. It’s not like it’s massive, but it’s comfortable inside, too. It’s closer. Tim Mullooly: Yeah, it is. Tim Mullooly: You were talking about giving back with the Dine and Donate. I know we met through the Chamber of Commerce. Is there any other sort of things that you guys are getting into within the community or thinking about doing? Zack Malecki: Yeah. You can’t do everything. We try to do as best we can. More importantly, I don’t want to say piggyback off of others, but you mentioned the Chamber, for example. The Chamber is a very philanthropic, I don’t know if that’s the correct word to use. It’s all about helping each other, whether it be business to business or business to that community, which we spoke of earlier. For example, somebody in their business will run a coat drive, in which case I would, if not for my customers, I would have my employees try to help get involved and ransack your closet for a jacket that you might not wear. Maybe one of your family’s jackets, or maybe your little brother grew out of his stuff and you have some leftovers. We try to get involved in as much as we can, be it put on by us or by others. A food drive. We did a Toys for Tots where we got a full box of toys for one of the other businesses in the Chamber. The Dine to Donate is something we do in-house, but whatever we can do, we try. A lot of people will solicit for gift cards for their gift auction. There’s a spaghetti dinner at the firehouse on Saturday. They’re just coming in trying to get everybody else, but why not $10 to help support your fire department? Get in there. Who doesn’t like spaghetti and meatballs? Tim Mullooly: Exactly. It’s always good to see businesses helping out other businesses. That’s why I like the Chamber so much. Zack Malecki: I think it’s very important, too, the name of the podcast is called Living With Money. I think it’s almost, I don’t know if I’d call it a personal responsibility, but if you are in fact living with money, I think there’s a certain element of giving back that is just socially responsible. Tim Mullooly: Help others live with money, as well. Zack Malecki: Sure. If you don’t have money, given them burritos. Tim Mullooly: Yeah, exactly. Everyone loves burritos. Tim Mullooly: What’s a normal workday like for you at Bubbakoo’s? How does your day start? When does it end, if at all, if it ends? Zack Malecki: Sure. Well, to be honest, being now a business owner the last six, seven months, it’s completely changed than what it was. I try to do all of the business and the administrational things on a Monday just because it leaves me the rest of the week to get involved with my team and actually be the face of the restaurant. I love to help customers. I love to roll burritos. But it’s pretty standard to your normal restaurant operations. You walk in in the morning and we make everything fresh every day. You get to prepping salsas, cooking beef, grilling chicken, and getting your line set up. Once 10:00 hits, you have to be ready to go. In our restaurant, you can go from zero to 60 in no time and you have to be prepared for that. I guess the other aspect of getting the food ready and all that is maintaining a clean area and getting your team set up so that they know what the day’s tasks are and who needs to do what and who’s responsible for which job for that day. Then towards the end of the day, close it down. We call it open to close and close to open. That’s pretty much how we operate. Tim Mullooly: You were talking about getting your team ready. What’s it like managing a team of employees? What are some of the benefits that you see and the challenges, as well? I’m sure it’s not all sunshine and roses when you’re managing a group of people. There’s probably some challenges along the way. Zack Malecki: No, not at all. Not at all. For me, I was always taught to hire hard and manage easy, meaning spend the time to really weed out your employees during the application process, or your applicants, I should say, and only hire the ones that you think are going to be the most capable. That’s going to allow you to manage your day to day easier because you don’t have to push your employees. They actually push you, in return. For me, it’s probably the most important thing that I do on a daily basis. All that business owner stuff, if I could do that overnight and not have a family, that would be when I would do that because I feel like the better you are at managing your people and empowering and encouraging, challenging, and training your people, the easier and better off you’re going to be. That’s not a simple formula by any means. I still haven’t gotten it and I will never get it. I think very few people have. But those are the people that are representing your name and your brand. If they aren’t awesome, or even just slightly less awesome than you are, because no one’s ever going to be better than you at what you want them to do. Zack Malecki: Yeah, right. No, I hope they are. I would love to see it. I’m not saying I’m not tooting my horn or anything, but you know what you need to do and you’re the best at getting it done. But if you can teach and really spend the time to train your people on, essentially, being your eyes, ears, your attitude, and your actions when you’re not there, then you’re doing okay and you can open up a second location or a third location. That’s really what growth is about. It’s about your people. Zack Malecki: We talked about it a little earlier. If you don’t have a foundation of great people, your business is not going to be as strong as it very well could be. That’s where we stand now. I have a really good team. You mentioned the challenges, not worrying about your employees and hiring the better employees. Even something as simple as showing up to work on time can be a challenge. I deal with it every day. For me, being part of giving back to the community, I have a lot of the Wall high school kids working for me. In the end, this isn’t their lifeblood. This isn’t their dreams. This isn’t what’s going to get them to the rest of their life. What they feel responsible for in this restaurant isn’t their driving force. For me, I have my son, Max, and my wife, Beth, at home. Zack Malecki: That’s why I come to work every day. Tim Mullooly: It’s good motivation there. Zack Malecki: Right. Whereas, they might just be putting gas in their car and things like that. As far as the biggest challenge that’s really what it comes down to, the people again. It’s making sure that they feel empowered enough to do great work and continue to grow and, hey, maybe they’re not going to be the CEO of Zack’s franchise or Zack and John’s franchise of Bubbakoo’s, but at least they can grow to a certain point where they could be a manager in one of our locations to help put them through college. Zack Malecki: Which is okay, too. Tim Mullooly: What would you say is your favorite part about owning your own Bubbakoo’s? Zack Malecki: There’s two parts to that. Number one, nobody’s watching over me, breathing down my throat, which is good and bad. Which is good and bad, because sometimes you need a little kick in the rear. It keeps you focused. But yeah, I mean, I think the biggest thing for me is now having a family, and I won’t call it the freedom because you still work very hard and I do put in a lot of hours, but if I need to take somebody to the doctor or if something happens, I can do that. I’m not chained into there where I have freedom in my schedule to be with my family. That’s huge, and I know my family would think that’s huge, too. That freedom, and I won’t call it a luxury, I hope that one day it becomes a luxury. I’m not talking about yachts and vacations and things. The ability the knowledge to know that you have a team of people running and taking care of your business almost as good as you would while you are dealing with a family emergency or even just having a day to go to your kid’s football game or something like that, that to me is awesome. Tim Mullooly: We all know Bubbakoo’s as amazing burritos. If you haven’t gone, I highly recommend it. Zack Malecki: It’ll make you see the world for the first time. Tim Mullooly: Exactly. The queso is unreal. Super good. Zack Malecki: Just mainline that. Tim Mullooly: But what’s one thing people might not know about Bubbakoo’s, whether it’s your location or the whole franchise overall, that you think that people should know? Zack Malecki: Well, for me, everybody thinks Bubbakoo’s is more of a fast food, I wouldn’t say everybody, but a lot of people have this idea that it’s fast food and it’s not healthy for you when, in fact, it’s a build your own concept. If you aren’t eating dairy because that’s just what your thing is, then we don’t have to put sour cream or shredded cheese in there. If you don’t eat red meat, that’s fine. We have grilled chicken, we have shrimp. A lot of people think it’s spicy. It’s not spicy. In fact, everything is seasoned, but it’s not spicy. The only way to make it spicy is by adding the hot sauce or jalapenos to make it spicy. Tim Mullooly: I can speak to that, too. I’m not a big spicy food guy. When I go to Bubbakoo’s, it’s just the right amount of spicy because you can pick what you want in there. Zack Malecki: Absolutely. The fact that it’s Mexican food, associated with the Mexican food, I think it’s more of American Mexican than actually just calling it Mexican. Just because it’s a burrito doesn’t mean it’s authentic. A lot of times, we have that obstacle where people come in thinking they’re going to be getting carne asada with the arroz con pollo and all these actual Mexican dishes when, in fact, we are an Americanized Mexican restaurant where you get a lot of flavor in there. Tim Mullooly: Not traditional Mexican food. Zack Malecki: Not traditional Mexican. I think that appeals to a lot more than the person who’s coming in for just Mexican cuisine. That’s not who we are. Zack Malecki: We never claimed to be. Tim Mullooly: Right. I think going back to the people think that it’s not healthy, you said you make everything fresh every morning. Tim Mullooly: It’s not like you’re getting this pre-made unhealthy food. You guys are cooking it yourselves every morning. I think that also speaks to the healthier quality of the food. Tim Mullooly: Okay. Moving on from the questions more geared toward Bubbakoo’s, we like to ask more open-ended conceptual questions to all of our guests that come on. How would you define being wealthy? We found that a lot of people have different answers to this. We like to get everyone’s unique spin on what wealth means to them. Zack Malecki: Sure. Earlier, we had talked about, we’ll call it, the “luxury,” and I think luxury and wealth, I think, a lot of people have this. I used the term “luxury” and I didn’t mean it the way that most people would think about when they say, “Oh, that’s luxury.” But the luxury of having your own schedule and being able to spend time with your family. I think that goes a long way in terms of forming a family and being safe and secure and have a feeling of everything’s going to be okay. Tim Mullooly: Yeah, not having any sort of uncertainty looming over you, just knowing that you’re going to be okay. Tim Mullooly: Yeah. Definitely I agree with that. Tim Mullooly: Outside of work, what does owning your own Bubbakoo’s and making money allow you to do that brings fulfillment to your life? What’s one thing other than work that you’re pretty passionate about? Tim Mullooly: I have to admit I also am, as well. I play the drums. Zack Malecki: Excellent. I play guitar. I think something’s happening right now. Tim Mullooly: Here we go. Zack Malecki: In this room. Tim Mullooly: This is the beginning of a rock band, starting here. Zack Malecki: Exactly. I don’t play guitar anywhere near as much as I should. If I could accomplish, say, anything at all, it would be to have a passive income playing music. It’s something that I really enjoy doing. It’s a lot of fun. That’s my end all, be all. We talked about wealth and all this. When you retire, what do you want to do with the rest of your life? Well, I just want to play music Friday and Saturday night and that’s it. Then the rest of the time, who knows? Spend with my family. Zack Malecki: Right, exactly. He’s happy. Just hanging out in his sandals. Tim Mullooly: Wearing a Hawaiian shirt and sipping on a drink, playing some songs. Tim Mullooly: Yeah. Four, five hours a night and calling it a day. Zack Malecki: Sure. Even if they don’t pay me. Zack Malecki: Give me a hamburger and I’m good. Tim Mullooly: Along the same lines as having an accomplishment, this is an interesting question. If you could accomplish one thing, with the catch being that nobody could ever know about it, for example, let’s say you climb Mt. Everest but no one would ever know that you did it, it’s your own personal thing, if there’s one thing that you could accomplish, what would it be? Zack Malecki: Some people are very humble, where they could climb Mt. Everest and not tell anybody. Chances are good that’s probably not me. But you’ll see a picture of me with the WWE belt over my head with the snow-capped mountains surrounding me. Zack Malecki: I guess for me, leaving a legacy for my children would be just the first thing that comes to mind. When I say “legacy,” it’s being able for them to, again, have that feeling of being okay and feeling secure and maybe leaving them, say, if the business is going good, I can leave that for them. It’s something that they can either, A, be a part of, or just reap the benefits of. Again, nobody really needs to know or care, and I don’t even care if they know. I guess that would be my answer to that. Tim Mullooly: I like that a lot. If you have a question that you’d like us to answer on Living With Money, get in touch with us. You can email us at livingwithmoneypod@gmail.com. You can find us on Facebook and send us a message there. You can tweet at us on Twitter. Shoot us a message on Instagram. We’d be happy to answer any of your questions. If you’re listening to this on iTunes, please subscribe to the podcast to get new episodes every week and feel free to leave us a review or a comment, because it would really mean a lot to us. Be sure to follow us on Twitter and Instagram @LWM_Podcast for more news and updates about the show. That’s going to do it, actually, for this episode of Living With Money. If you’ve never been to a Bubbakoo’s, I highly recommend it. Like I said before, great food and great atmosphere. Definitely if you’re in the Wall area, stop by in the Kmart plaza. Zack Malecki: Thank you for having me. It’s been a lot of fun. I appreciate it. Tim Mullooly: Awesome. In the show notes, I’ll link to Bubbakoo’s website if you’ve never heard of it. Check it out. You can even order food online. Definitely check out the website. Check them out on Facebook and stop in if you’re hungry. Zack Malecki: Even if you’re not hungry. Zack Malecki: Stop in anyway. Say hi. Tim Mullooly: Yeah. That’s going to do it for this episode. Thanks for listening and we’ll see you on the next one.